When you receive an occasional check from an aunt, insurance company or elsewhere, you have to find time and a branch to make your deposit. Not anymore. The mobile deposit feature of Dupaco's mobile app lets you snap a photo of your check and make your deposit electronically. It's FREE, easy and of course it's secure. First, endorse the back of your paper check with your name and the words "For Mobile Deposit only at Dupaco." 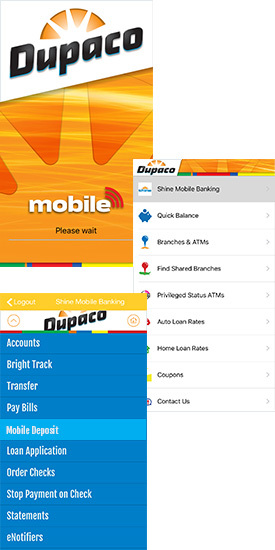 Then, launch the app, and log in to Shine Mobile Banking. Select Mobile Deposit from the main menu of Shine Mobile Banking, and follow the prompts to photograph and deposit your check. You'll take a photo of the front and back of a properly endorsed paper check. The check will pass through certain checkpoints for validation and, if accepted, will be credited to your checking or primary savings account. Deposits are not immediately available. Deposits made between 8 a.m. and 4 p.m. CT Mon.-Fri. will be posted within 5 hours. Deposits made after 4 p.m. CT Mon.-Fri. will be posted by 10 a.m. CT the next business day. Dupaco's funds availability policies apply, with $200 available once the deposit is posted and the remainder in 2 business days. For details and eligibility, refer to our mobile deposit FAQ. After taking the picture and the funds go through into my account, what do I do with the check? Do I still have to bring it in? Mail it? Hi Yvonne, we recommend that you hold on to the check for 14 days after the full deposit has been posted to your account, and then destroy it. Hi Ruth, I'm sorry to hear you are having trouble finding the online banking page. The sign-in is on our homepage, off to the right sidebar where it says "Online Banking".